Some food enthusiasts will say that if you haven’t bit into a breaded and deep-fried gooey cheese curd, then you simply haven’t lived. While not available solely in Wisconsin— fried cheese curds are on the menu at Culver’s, a fast-casual joint based in the Dairy State but with locations in other regions, too—the selection of fried cheese curds is vaster in Milwaukee than in any other city. Dips and sauces on the side range from ranch to chipotle, and the curds--often served in a basket--are yet another opportunity for a restaurant to prove its commitment to local sourcing. While the password to this speakeasy-style restaurant and bar is a secret to most, its fried cheese curds are far from hush-hush. Dubbed C4 Fried Cheese Curds, and on the appetizers menu, Wisconsin white-cheddar cheese curds are breaded and dipped to order… and “top-secret” dipping sauces are on the side. 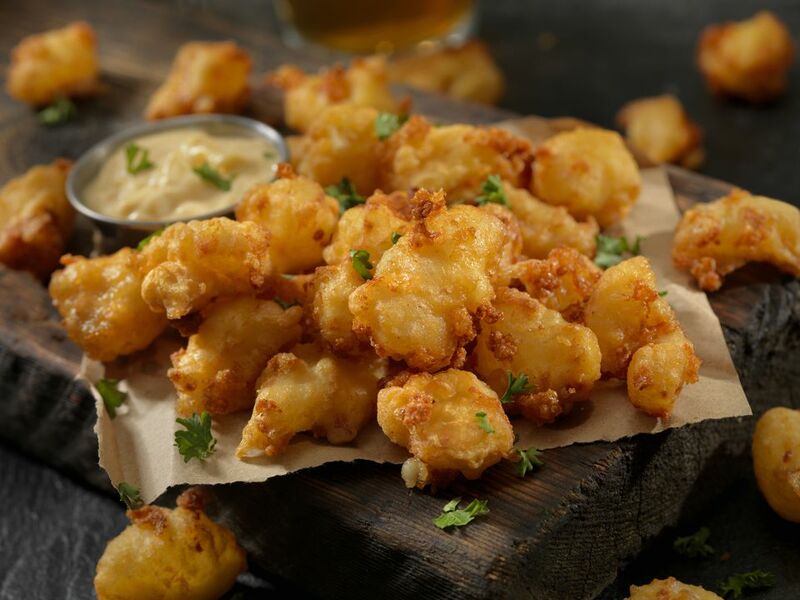 Because everything on the menu links back to Wisconsin, naturally, this year-old bar—linked to a lifestyle brand that includes logoed hoodies—is going to serve up fried cheese curds. Here, the curds are fried in Lakefront Brewery East Side Dark beer and served with a side of house ranch dip. This hotel in Walker’s Point has three eateries: Smyth (open for Sunday brunch and nightly dinner), Branded (an indoor bar) and The Yard (warmer months only, on one of the city’s biggest patios). You can also dine in the industrial-chic lobby. No matter where you sit, you’d be remiss not to order the Clockshadow Creamery cheese curds, sourced from the neighborhood’s creamery and tempura fried before they’re placed into a basket with newsprint lining, Chipotle aioli, ​and house-ranch dressing come with each order. This Stevens Point-based burger joint has just one location in the Milwaukee area, in Franklin. Just like you can top your matt paddy with Wisconsin cheese curds, you can also start the meal with a cheesy app—hello, fried cheese curds! They are so big, says the menu, that your jaw will drop and your mouth water. With a 600-bottle wine list, you might be surprised that this steakhouse (in a quiet corner of the bustling casino, as its finest-dining experience) offers fried foods. But these aren’t just any fried cheese curds, dumped into a basket and served with ranch dip. No, the Wisconsin Cheese Curd Fritters are artfully plated in a square bowl and come with tomato jam and smoked-Gouda sauce, for upscale flair and flavor. This place might be best known for its burgers—after all, they were the winner of the Travel Channel’s Food Wars—but the Wisconsin cheddar cheese curds are a popular order, too. Served with chipotle ranch to dip ‘em in, the curds are on the appetizers menu, the perfect precursor​ to a burger. Nearly every dish here has Wisconsin roots and that includes the cheddar cheese curds, which are breaded and fried, and arrive in a basket with a ramekin of buttermilk-ranch dressing. Different than most places serving fried cheese curds, you get a choice between Traditional and Buffalo flavored curds, or half and half.